The aye-aye. Credit: Photo by David Haring. Alcohol is widespread in nature, existing in fermented nectars, saps and fruits. It is therefore a natural part of many primate diets, and it follows that primates have evolved to digest alcohol quickly to minimize toxic effects. But given that alcohol is also a source of calories, it is plausible that alcohol is attractive to some primates, including, hypothetically, our human ancestors. In fact, previous research found that humans and African great apes have a genetic mutation that radically accelerates alcohol digestion. However, this mutation is also shared with the aye-aye, one of the oddest animals on Earth. The question, then, is whether aye-ayes are attracted to alcohol. In the first controlled study of its kind, Dartmouth researchers found that two aye-ayes and another prosimian primate (a slow loris) could discriminate different concentrations of alcohol, and further, that each species preferred the highest concentrations of alcohol available to them. The findings of this Dartmouth study will be published in the open-access journal, Royal Society Open Science. 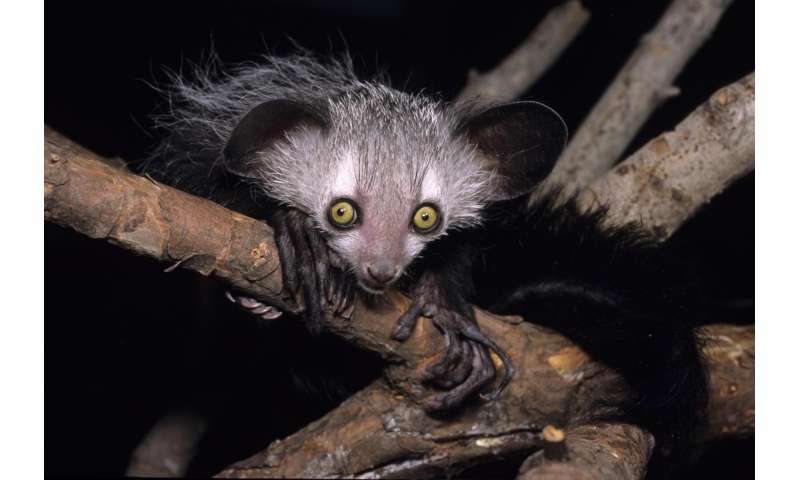 The aye-aye is a nocturnal lemur endemic to Madagascar with a lineage dating back nearly 70 million years. They have an elongated, bony finger for detecting and extracting grubs from decaying tree trunks. "Aye-ayes are essentially primate woodpeckers" said Nathaniel J. Dominy, a professor of anthropology and biological sciences at Dartmouth. "So it is puzzling that they can digest alcohol so efficiently" he added. In the wet season, however, aye-ayes devote as much as 20 percent of their feeding time to the nectar of the traveler's tree, a primitive plant from Madagascar. "If the nectar is fermented, then the hyper-efficient alcohol digestion would make ecological sense" reasoned Samuel Gochman, a Dartmouth student and lead author of the study. "Since we didn't have access to such flowering trees for the study, instead, we tested whether aye-ayes are attracted to alcohol in a nectar-simulating solution of sucrose." The authors also tested the preferences of a slow loris, the only primate known to consume fermented nectar in the wild. At the Duke Lemur Center in Durham, N. C., Gochman conducted multiple-choice feeding experiments with two aye-ayes, Morticia and Merlin, and a slow loris, Dharma, to test for an aversion or preference to varying concentrations of alcohol in simulated nectar. The alcohol concentrations were low (0.0 to 5.0%) to reflect levels found in nature. Each liquid treatment, together with two controls, was placed in a circular array of small-recessed containers in a round resin outdoor table. The position of the liquids was randomized and behavioral data were collected blind to the contents, to avoid observational bias. Each of the two aye-ayes participated in a trial once a day for 15 days for a total of 30 trials. 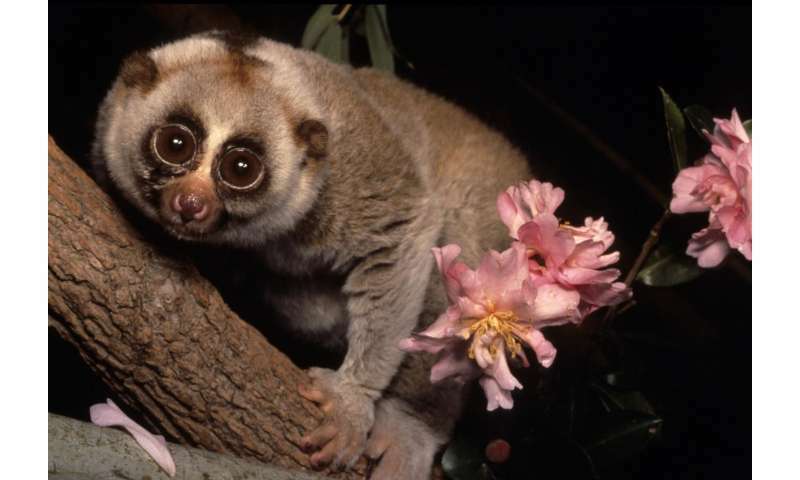 The slow loris participated in a trial each day over five days for a total of five trials, as time was limited. The slow-loris. Credit: David Haring. The authors found that the aye-ayes could discriminate between tap water and the varying concentrations of alcohol, and that they adjusted their intake accordingly. Further statistical analysis showed that the aye-ayes preferred the highest concentrations of alcohol. Unexpectedly, the aye-ayes continued to probe the containers with the highest concentrations long after they were emptied, suggesting that they wanted more. The five trials with the slow loris were too few to yield statistical results, but the pattern of discrimination and preference was practically identical. None of the animals exhibited signs of impaired coordination or behavior, as intoxication was not part of the study. "This project has definitely fueled my interest in human evolution" said Samuel Gochman, referring to the larger implications of the study. "Our results support the idea that fermented foods were important in the diets of our ancestors." Some researchers have suggested that our genetic mutation for efficient alcohol digestion, which is shared with chimpanzees and gorillas, is linked to the consumption of fermented fruits on the forest floor, a dietary behavior that could have pre-adapted humans for the Neolithic Revolution. And some archaeologists have argued that making beer was our primary motivation for harvesting and ultimately domesticating cereals, the plant that give rise to complex societies. Perhaps a craving for alcohol made all the difference. Prosimians prefer alcohol or alcohol prefers prosimians? This aspect must be clearly resolved before calling it "study". Now we know why the slow loris is slow... he's just hung over. And the finger of the aye-aye may have been evolved as a handy beer bottle opener. The important scientific question to be resolved now is: Do they like craft beer or just drink cheap macrobrew ? In the news tonight, scientists confirm why you should never get a prosimian for a pet.